What machine/graphics card(GPU) should I get? Update August 2015: hardware advances so quickly. You can now buy a US$360 windows tablet that runs Expresii Full version fast enough and guess what, it even comes with WACOM stylus support! 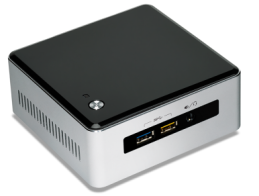 And you can also buy a tiny Intel's NUC. Their 5th generation CORE processors are already fast enough for Expresii Full. For DIYers: You should get a recent graphics card from Nvidia or AMD in the range of US$60-100. 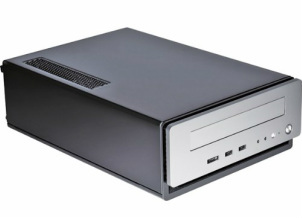 Recommended models include Nvidia GT640, GT730, AMD R7 250, HD 7730 or HD 7750. These are all mid-to-low-end cards that also come in a low-profile forms (e.g. this GT 640 or this 7750). It is possible to build a sleek PC capable of running Expresii like using the shoe-box-sized Antec ISK-310 case (shown on right). You don't need a very beefy machine. The CPU could be something like the Intel Core i3 2105, which already gives a very good performance for Expresii. However, don't use a very low-end CPU (like Intel's Atom from 2014 or before). We tried the recent low-cost Athlon 5350 (2014) paired with a GT 640 - it works fine but the CPU bottle-necked the performance giving only half the frame rate a machine with GT 640 should give. Budget-wise, if you already have a regular PC and just need to upgrade the graphics card, the upgrade only costs you around $80. If you need a new PC, the cost of such a machine (excluding input device and monitor) could be sub-$400. The above assumes you paint full-screen on a regular full-HD monitor. If you plan to use a 4K monitor, you will need a better graphics card (e.g. GTX 1050) to get a fluid frame rate. For Non-DIYers: You can simply buy a ready-to-use PC designed for "gaming". For example, e.g. this Brix machine from Gigabyte. Many of these "gaming" machines (e.g. one that comes with a GTX 760) are actually an overkill for Expresii (unless you want to paint full-screen on a 4K monitor). If you prefer a laptop, one good option is to get laptops with an Nvidia GT 750m, e.g. this Acer V5-573G. What pen-based input device should I get? To make the best out of out app, we recommend using a pen input that supports tilt sensing (i.e. it gives the angle the stylus is tilted). To our knowledge, only a few brands have products supporting tilt sensing: Wacom, Hanvon / Parblo , Bravod , Huion. Wacom's products are more mature, while Hanvon's or Parblo's are cheaper. For Wacom, note that they recently re-branded their professional grade tablets from "Intuos" to "Intuos Pro". That means, the older Intuos 3, 4, 5 and the latest "Intuos Pro" support stylus tilt sensing but the latest "Intuos" doesn't. We currently do not make use of the pen Twist data supported by the Wacom 6D art pen for our round brushes. In the future, we may add some flat brushes that makes use of such twist reading. If you would like to buy a Wacom Cintiq for on-screen stroking, note that the graphics on the "Cintiq Companion" (with Intel HD Graphics 4000) is not fast enough. We may later release a lite-version of Expresii that requires less GPU power, but for now the HD Graphics 4000 is not recommended. In one of our demo videos, we were using a "Cintiq Hybrid" connected to a laptop with GPU GT 750m. The "Cintiq Hybrid" only acts as a monitor and a pen-input device. What sets Expresii apart from all other painting apps? Our MoXi paint engines was the first to allow organic paint flow simulated so nicely. For the first time, you can really do digital Eastern calligraphy with our virtual brush. When you get the Expresii app, remember to zoom in to appreciate the amazing rendering quality. Together these elements make Expresii such an achievement in digital paint program history! While most other painting apps facilitate a Western way of painting, Expresii brings a Eastern way of painting to the table. Enjoy a more gestural, abstract, and expressionistic way of painting with Expresii today! Your simulation blew me away. Why is it so realistic? Our simulation uses computational fluid dynamics for paint flow. The brush dynamics is also based on physics simulation. This is why it looks so realistic. However, our goal is not really to make Expresii the most "realistic" paint program in the world. We bring in physics only for getting the organic quality of real artwork into the digital world. So, we prefer to say our result is organic rather than realistic. Currently, our paint simulation is more like one that simulates Eastern ink painting on rice paper, which is similar but different from Western watercolor. Ink mostly seeps through paper fiber in the former while paint mostly move on top the paper surface in the latter. Plan to support other art media? Yes, we do have. Our Software Architect/Technical Director Nelson Chu is a leading expert in digital painting technology. His ground-breaking MoXi ink/watercolor work wowed the graphics community since 2005 and his work in Project Gustav unveiled by Microsoft in 2010 also improved the state of the art in oil and pastel simulation. With the right talents and their freedom ensured, we will continue to push the boundary in digital painting technology. Nelson did adapt his MoXi simulation to Western Watercolor back in 2007 with the unprecedented feature of varying from wet-in-wet diffusion to backruns. Plan to support other platforms? We do have plan to support Mac OS. However, iOS and Android support is less likely. iOS is a completely different OS from MacOS which requires a significant effort in porting. The closest thing to our watercolor on iOS is the watercolor in Adobe Sketch, released in 2015. We actually licensed our original MoXi tech to Adobe back in 2006 and after so many years, that's what they came up with. Their watercolor looks like a simplified version our over-a-decade-old MoXi watercolor, so you see even Adobe can do only so much for iOS or Android. [2018-06 update] I wanted to add that the recent announcement of Apple depreciating OpenGL is really discouraging. I think this is a bad move by Apple trying to force developers to use their own Metal API instead of open standards like OpenGL or Vulkan by dropping support of open standard. FYI, Expresii currently uses OpenGL. Why didn't you start with iOS? Our development traces back to before the iPad even existed. When the iPad first came out in 2009, the performance was too weak for a meaningful watercolor simulation. And remember the Apple Pencil also didn't exist before 2015. On the software side, most graphics libraries were first written for the PC platform since It was the PC gaming industry that drove the development of the modern GPU. Windows was the only possible platform to start with both hardware & software-wise. Now hardware-wise the iPad Pro is good enough. However, our current code base uses a 3rd-party graphics library which doesn't support Apple's Metal API. Again, porting is significant effort. In contrast, our program runs on both desktop and mobile (laptops & tablets) on Windows without us making a single change because Windows is the same Windows for both desktop and mobile. And note that Windows keeps supporting OpenGL as well as their own DirectX, unlike Apple now trying to make us switch from OpenGL to their own Metal API.